Whether you’re a ball-busting professional who bills by the hour or just a time-obsessed weirdo, Eternity Time Log could very well be your next best friend because it’s awesome at tracking what you do and for how long. In reality I don’t have much of a need for an app like this, but I’ve always wondered how many hours a day I spend wandering around my neighborhood with my dog Terry, a.k.a. The Urinator, so I worked Eternity into my routine and got a pretty clear picture of what kind of time I’ve been committing to my hairy little friend. Just like the iPhone’s built-in clock/timer/stopwatch, Eternity runs in the background and lets you do whatever the hell you want while it logs your time. Listen to music, send emails, play with other apps… just go about your day as usual, and your time gets tracked. It’s flawless. Komorian also made it possible to not only label your activities, but you can also group activities together so that you can see how long you’ve spent on the group as a whole and each activity inside the group. 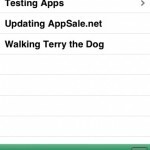 Example: I have an activity group called “Testing Apps” and inside that group is “Orion’s Belt” and “Money Catcher”. 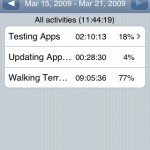 Eternity tells me how long I spent on each app, and also how long I spent on Testing Apps as a whole. Other great functions are the ability to view daily/weekly/monthly reports, export the reports as a CSV file, and there’s also an option to show report percentages against the time interval (day, week, etc.) or against the total time logged. In other words, you can choose whether Eternity tells you how much of your day was spent walking The Urinator or how much of your logged time was spent on that activity. Personally I find the ‘logged time’ option to be more useful, but others who are monitoring longer activities (how much of my life do I spend sleeping?) might disagree. I can really only think of one thing that Eternity Time Log can’t do which is log two different activities at once, and something tells me that it may not be possible. If it is, I’d be willing to bet that Komorian will make it happen. There is a bug in Eternity 1.2 and 1.3 I’d like you to be aware of. 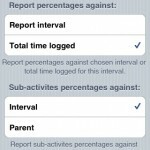 Logs are not always exported correctly when you have “&” in activity names or notes. It will be fixed in the next update. Ok then! Gotta love a developer who’s on top of things. If $7.99 sounds steep to you, maybe you should ask yourself whether time really IS money. If the answer is no, get the lite version… but if the answer is yes, buy the app and enjoy it because it’s totally worth the asking price. Follow the link in this comment to visit Eternity website. I wish there was a way to not have to Start and Stop to log time. For example, what if you forget to push Start before you left the house to walk Terry. 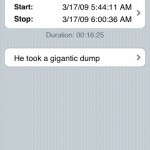 But the next day, remembered that you needed to log that time. Is there an easy way to go back and log it rather than having to hit Start/Stop and edit the time and date? Not yet (in v1.3). Sorry about that.